Lyric has no idea that there's a realm outside the human one she lives in. When fate and circumstances are pulled from her hands after an accident, she finds out that nothing is at it seems. There is a war surrounding her and when Lyric realizes that they are searching for her, she must rely on those she once trusted: a boy who isn't who she thought, and a new realm of warriors who have come to protect her as she trains. For the darkness is coming, and the Queen of Obscurite wants to ensure that the King of Lumiere can't get his hands on Lyric. And the only way to ensure that is if Lyric herself is no more ... no matter the cost to prophecy. 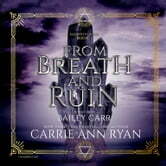 Book 1 of Elements of Five From Breath and Ruin by Carrie Anne Ryan. I’ve got to admit I struggled getting into this book as a ebook but then started the audiobook and couldn’t turn it off. I devoured the first 16 chapters in no time. Lyric is a just about to go to college kid that still hasn’t figured out what she wants to do with her life but everyone around her seems to have there life sorted. Lyric has been having horrible nightmares that feel like they are trying to tell her something but she just misses the mark. Lyric bumps into her old school friend that suggests they go on a walk in mountains but after an accident Lyric becomes aware of other worldly beings and that her crush Rhodes and his sister Rosamond aren’t what she thought and there telling Lyric she is the lost Spirit Priestess that could unite the other Kingdoms. A lot goes on in this book with fighting other wielders people and trying to get to Rosamond but losing people on way but also trying to introduce a new world sand series is difficult. I did feel at time like Lyric was becoming annoying with always explaining she didn’t know what was going on or that she didn’t know how to use her magic or be useful but the ending of this book got very interesting and developed really quickly. I was a little disappointed with ending with Lyric but absolutely gutted over her bff Braelynn but hopefully that becomes very interesting in next book. Differently a winner but get the feeling next books in series are better.